A miniature book is a very small book. Standards for what may be termed a miniature rather than just a small book have changed through time. 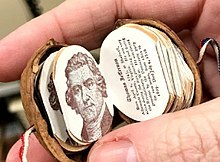 Today, most collectors consider a book to be miniature only if it is 3 inches or smaller in height, width, and thickness, particularly in the United States. Many collectors consider nineteenth-century and earlier books of 4 inches to fit in the category of miniatures. Book from 3-4 inches in all dimensions are termed macrominiature books. Books less than 1 inch in all dimensions are called microminiature books. Books less than 1/4 inch in all dimensions are known as ultra-microminiature books. 2.2 "Smallest Book in the World"
Miniature books stretch back far in history; many collections contain cuneiform tablets stretching back thousands of years, and exquisite medieval Books of Hours. Printers began testing the limits of size not long after the technology of printing began, and around 200 miniature books were printed in the sixteenth century. Exquisite specimens from the 17th century abound. In the 19th century, technological innovations in printing enabled the creation of smaller and smaller type. Fine and popular additions alike grew in number throughout the 19th century. 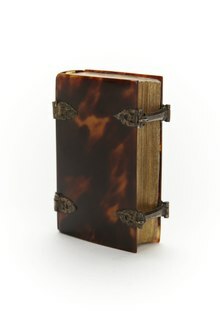 While some miniature books are objects of high craft, bound in fine Moroccan leather, with gilt decoration and excellent examples of woodcuts, etchings, and watermarks, others are cheap, disposable, sometimes highly functional items not expected to survive. Today, miniature books are produced both as fine works of craft and as commercial products found in chain bookstores. Some popular types of miniature books from various periods include Bibles, encyclopedias, dictionaries, Bilingual dictionaries, short stories, verse, famous speeches, political propaganda, travel guides, almanacs, children's stories, and the miniaturization of well-known books such as The Compleat Angler, The Art of War, and Sherlock Holmes stories. Abraham Lincoln, Proclamation of Emancipation (Boston : John Murray Forbes, 1863). This miniature edition was the first of this text. It is estimated that a million copies were distributed to Union troops. 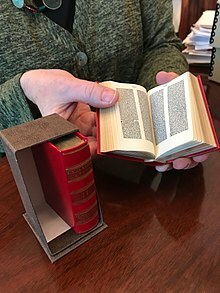 "Smallest Book in the World"
Many books have claim to the title of smallest book in the world at the time of their publication. The title can apply to a variety of accomplishments: smallest overall size, smallest book with movable type, smallest printed book, smallest book legible to the naked eye, and so on. 750: Hyakumantō darani or ‘One Million Pagoda Dharani.' Also one of the earliest known printed texts, these 2-3/8" tall Buddhist charms were printed, rolled into a scroll, placed in miniature white pagodas, and distributed to Buddhist temples. A million were printed at the command of Japanese Empress Shotoku. 1674: Bloem-Hofje (Amsterdam: Benedict Schmidt, 1674). For more than two centuries, this remained the smallest book printed with moveable type. 1878: Dante, Divina Commedia (Milan: Gnocchi, 1878). 500 pages. 5 cm x 3.5 cm. Typeset and printed by the Salmin Brothers of Padua. 1897: Galileo Galilei. Galileo a Madama Cristina di Lorena (Padua: dei Fratelli Salmin, 1897). 150 pages. This remains to this day the smallest book set from movable type. 1900: Edward Fitzgerald, trans. The Rubaiyat of Omar Khayyam (Cleveland: Charles H. Meigs, 1900). 1932: The Rose Garden of Omar Khayyam. 1985: Old King Cole (Paisley: Gleniffer Press, 1985). Height: 0.9 mm. For 20 years this was the "smallest book in the world printed using offset lithography". 2001: New Testament (King James version) Cambridge: M.I.T, 2001). 5 x 5 mm. 2002: Anton Chekhov, Chameleon (Omsk, Siberia: Anatoly Konenko, 1996) 0.9 mm x 0.9 mm. 2016: Vladimir Aniskin, [Untitled] (Russia: Vladimir Aniskin, 2016). "The micro-book consists of several pages, each measuring only very tiny fractions of a millimeter: the precise size of the pages is 70 by 90 micrometers or 0.07 by 0.09 millimeters — too small to be read by the naked human eye. Made by gluing white paint to extremely thin film, the pages are hung from a tiny ring binder that allows them to be turned. The whole construction rests on a horizontal sliver of a poppy seed." In 2007, archaeologists found a miniature Bible (Glasgow: David Bryce & Son, 1901) tucked into a child's boot hidden in a chimney cavity in an English cottage in Ewerby, Lincolnshire. Shoes were placed in such locations as early as the fourteenth-century as anti-witchcraft devices known as "spirit traps." The creation of a miniature book requires exceptional skill in all aspects of book production, because elements such as bindings, pages, and type, illustrations, and subject matter all need to be approached with a new set of problems in mind. For instance, the pages of a miniature book do not fall open as do those of larger books, because the pages are not heavy enough. Bindings require exceptionally thin materials, and creating type that is readable and beautiful requires great skill. Many printers have created miniature books to test their own technical limits or to show off their skill. Many books have claimed the sought-after title of "smallest book in the world," which is now held by experiments in nanoprinting. HarperCollins, Collins Gem Books division. Oxford University Press published many miniature religious books and children's books in the late 19th and early 20th century. Running Press, known for miniature books marketed as impulse buys in bookstore checkout lines. Sanrio, known for tiny blank books in its Hello Kitty, Little Twin Stars, and other lines starting in the late 1960s and early 1970s. The largest collection of miniature books in the United States is held by the Lilly Library at Indiana University Bloomington. Donated by collector Ruth E. Adomeit, it numbers more than 16,000 items. 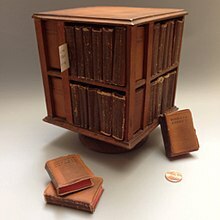 Second in size is the McGehee Miniature Book Collection of more than 15,000 items, at the Albert and Shirley Small Special Collections Library at the University of Virginia. The collection was donated by collector Caroline Yarnell Lindemann McGehee Brandt, a charter member of the Miniature Book Society. The University of Iowa Special Collections and University Archives holds a collection of 4,000 miniatures donated by collector Charlotte M. Smith, which they feature on tumblr. Rutgers University Library holds some 1,500 volumes in the Alden Jacobs Collection. Washington University in St. Louis holds a significant collection, some on view in a permanent exhibition space, donated by Julian Edison. The Morgan Library & Museum houses more than 8,000 miniature books. Queen Mary's Dolls' House at Windsor Castle in Great Britain contains a miniature library of 200 books created expressly for the collection in the 1920s at a 1:12 scale. Along with reference volumes, a Bible and the Quran, the library includes works--some written expressly for the collection--by prominent authors of the day such as Arthur Conan Doyle, Thomas Hardy, and Vita Sackville-West. The books were bound by Sangorski & Sutcliffe, and contained miniature bookplates illustrated by E. H. Shepard. The Baku Museum of Miniature Books in Azerbaijan is the only museum dedicated only to miniature books. The Museum Meermanno in the Hague, Netherlands contains a significant miniature collection on permanent display. Prominent historical figures who collected miniature books include President Franklin D. Roosevelt and retailer Stanley Marcus. ^ "What is a miniature book?". MIniature Book Society. Retrieved 4 April 2018. ^ Grimes, William (2007-05-20). "Catching Up on a Little Light Reading". The New York Times. ISSN 0362-4331. Retrieved 2018-04-15. ^ "Beautiful Miniature Books That Are Worth Sacrificing Your Eyesight For". Atlas Obscura. 2017-05-26. Retrieved 2018-04-14. ^ "Miniature Books Through the Years". sites.oxy.edu. Retrieved 2018-04-14. ^ "Miniature Books". American Antiquarian Society. 2012-10-22. Retrieved 2018-04-14. ^ "Civil War Troops' Mini Emancipation Book on Display". NPR.org. Retrieved 2018-04-14. ^ Monro, Alexander (2017-02-21). The Paper Trail: An Unexpected History of a Revolutionary Invention. Knopf Doubleday Publishing Group. p. 132. ISBN 9780307456694. ^ Mack, John (2007). The Art of Small Things. Harvard University Press. p. 10. ISBN 9780674026933. ^ "Smallest Book". Saturday Magazine. 1.1: 60. December 7, 1878. ^ "Year 37 – 1897: Galileo a Madama Cristina di Lorena (1615) by Galileo Galilei | 150 Years in the Stacks". libraries.mit.edu. Retrieved 2018-04-14. ^ Editorial, Reuters. "Tale of Teeny Ted said to be world's smallest book". U.K. Retrieved 2018-04-14. ^ Kostyuk, Yaroslav (July 2007). "Russian Miniature Books displayed at the Taipei International Book Exhibition 2007". MIniature Book Society Newsletter: 6–7. ^ News, A. B. C. (2016-03-01). "Siberian Man Claims to Have Created the World's Smallest Book". ABC News. Retrieved 2018-04-14. ^ Viegas, Jennifer (February 9, 2007). "World's Smallest Bible Found in a Boot". Discovery News. Archived from the original on February 17, 2007. Retrieved April 14, 2018. ^ "Grolier Club Exhibition" (PDF). Miniature Book Society Newsletter. 76: 8. October 2007 – via Miniature Book Society. ^ "Tiny royal doll house book published". BBC News. 2017-10-17. Retrieved 2018-04-14. ^ "Library". www.royalcollection.org.uk. Retrieved 2018-04-14. ^ "Tiny Sherlock Holmes book for Queen Mary's dolls' house – in pictures". The Guardian. 2014-11-16. ISSN 0261-3077. Retrieved 2018-04-14. Percy Edwin Spielmann, Catalogue of the Library of Miniature Books Collected by Percy Edwin Spielmann. Together with Some Descriptive Summaries, London, Edward Arnold, 1961. Louis W. Bondy, Miniature Books: Their History from the Beginnings to the Present Day, London, Sheppard Press, 1981. Doris V. Welsh, History of Miniature Books. Albany, Fort Orange Press, 1987. Anne Bromer and Julian Edison, Miniature Books: 4,000 Years of Tiny Treasures (New York: Harry Abrams, 2007). Wikimedia Commons has media related to Miniature books.